Aristois has been updated to support the newest version of Minecraft 1.11.2. This hacked client works on Minecraft Realms. – Fixed ALL render issues. – Different colors for ESP/Tracers. – Auto disable bobbing while tracer is on. Speed allows you to run/walk really really fast. Spider allows you to climb blocks much like a spider does or like when you climp up ladders. Freecam allows you to exit your body and freely fly around the world as if you were in spectator mode. Allows you to exit your body and freely walk a short distance then have your body teleport to your position. Fastladders allows you to climb up ladders faster. ExtraElytra allows you to glide for a much longer time because of reduced speed loss. Waterjump allows you to automatically jump on water that courses you to move really fast. ScaffoldWalk allows you to place blocks under you as you walk making walking in the air easier. AntiAFK stops servers from kicking you for being AFK by moving you around. BunnyJump allows you to jump really high. BHop allows you move really fast by jumping. Sprint automatically make you sprint when moving. InventoryWalk allows you to walk around using wasd when your inventory is open. AlwaysSneak spams the server with sneak packets tricking the server into thinking you are always sneaking. ChestSteal allows you to automatically take items out of chest and put them in your inventory. AutoItem automatically switches your item to the most efficient tool for the job. AutoReconnect automatically reconnects you to the server when you have been disconnected. AutoEat automatically switches and eats food on your hotbar when hungry. AutoArmor automatically equips the best armor in your inventory. AutoFish automatically reels in fish and throws fishing rod when fishing. AutoSplashPot will automatically throw splash pots when you’re low on health. AutoSoup automatically switches and eats Suup on your hotbar when needed. MacroCommand allows you to set commands that will run when this module is activated. AutoWalk automatically makes you walk forwards. Fastbreak allows you to break blocks at a much faster rate. Fastplace allows you to place blocks at a much faster rate and throw item faster. Nuker is a creative only module that allows you to automatically remove blocks in a sphere around you. ScreenShareMode hides all traces of the client from your screen so you to show your screen with out fear of being “caught”. MiddleClickFriends allows you to press the middle mouse button on other players adding them to your friends list stopping you from targeting them with killaura. UnfocusedCPU sets your games FPS to 5 when its not being used allowing your PC to run smoother out of MineCraft. ChatMute hides commands and messages in the chat. ChatColor al you to type using color and see color in the chat. NameProtect sets your name on your screen to something else to hide it from people viewing your screen. IRCMute hides commands and messages in the IRCchat. HackerDetector shows you in chat when players near you are hacking. Spams the chat with custom text set by the player. InfinityChatLenght allows you to write strings with unlimited characters in the chat. FancyChat changes the text that you write in the chat show in a different chat. GUI Color allows you to change the color of the clients GUI. Autorespawn automatically respawns you when you die allowing you to get back into the action sooner. Derp makes your players head spin around and look silly. Hud shows info on the Server type, your position, FPS and ping in the top left corner of your screen. ActiveMods shows all active modules in a list on the top right side of your screen. Phase allows you to glitch through transparent blocks on servers with No-Cheat-Plus. Regen allows you to regen health on servers without a anti-cheat. Truesight allows you to see entity that are invisible such as players and armor stands. Antiblind disables the blindness effect on the player allowing you to see when blind. ArmorHud shows info on what armor you have equipped and it durability when in survival/adventure. ItemESP shows a white outline on items when dropped that can be seen through blocks. Nametags changes players names to be bigger and easier to see from a far and through walls. HealthNametags shows info on the amount of health other players have on their nametag. 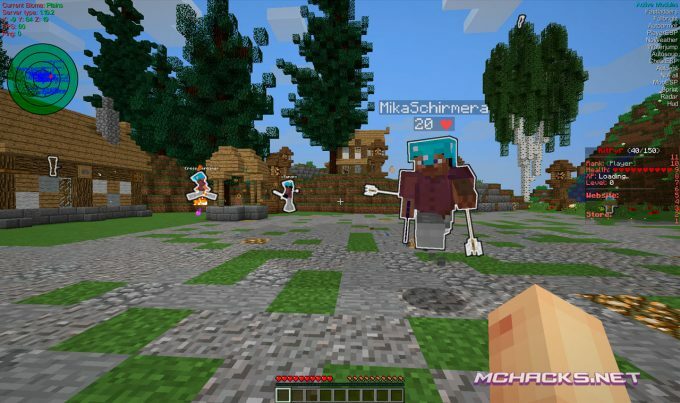 MobESP shows a white outline on mobs that can be seen through blocks. PlayerESP much like the MobESP, it shows a white outline on players that can be seen through blocks. ChestESP shows a green transparent block around chests that can be seen through blocks. Tracer shows lines from your crosshair to nearby players that turns redder the closer you are. Waypoints shows created waypoints nametag and shows tracers to your waypoints. NoWeather hides rain particles and stops all weather sounds. Fullbright allows you to see in the dark by making the environment bright. XRay allows you to see through selected blocks to find ores and bases. CowTracer shows lines from your crosshair to nearby cows that turns redder the closer you are. 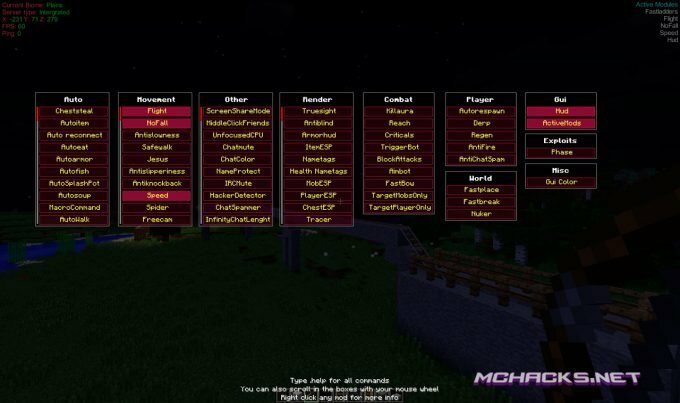 Killaura allows you to automatically hit all hostiles mobs as well as players around you who are not added to your friends list. Reach allows you to break and place blocks 7 blocks away instead of 4 and you can he entitys from 7 blocks away. Criticals makes every hit you make a critical hit. TriggerBot allows you to automatically hit the player you are looking at that is not added to your friends list.